Bluetongue disease, a virus that has killed livestock across Europe, has been found in the UK for the first time - in a cow at a farm in Suffolk. There have been nearly 3,000 cases in Northern Europe since July, which had fuelled fears of its UK arrival. Cattle, sheep, goats and deer can be infected, but the insect-borne virus is not thought to pose a risk to humans. The discovery near Ipswich came as Surrey's foot-and-mouth protection zone was extended after a new case. The farming industry is already struggling with movement and export restrictions imposed because of the outbreaks in Surrey. On Saturday cattle on another farm - the sixth premises to test positive since the disease was first discovered in August and the fourth in the past 11 days - were slaughtered and the protection zone was extended. 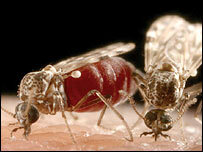 Bluetongue disease is transmitted by the Culicoides imicola midge. It is passed from animal to midge, and from midge to animal, but is not transmitted from animal to animal. The virus has long blighted Africa, but in recent years has begun to spread northwards into Europe. Some scientists believe that climate change could be behind its spread, as warmer temperatures have seen the biting insects gradually move north. Officials warned last month that the UK was at risk from bluetongue after outbreaks in the Netherlands, Belgium, France and Germany. Animals with the disease experience discomfort, with flu-like symptoms, and swelling and haemorrhaging in and around the mouth and nose. They can also go lame and have difficulty eating properly. "In Europe, where this virus has been circulating in quite an extensive outbreak this season, there has been significant illness in sheep and cattle and loss of production," said the government's deputy chief veterinary officer Fred Landeg. The infected animal was on a small cattle and sheep farm outside Ipswich, he said. The cow would be killed and tests conducted overnight to determine whether bluetongue had spread to other animals. It would not be classed as an outbreak unless other cases were confirmed, he said. The Department for Environment, Food and Rural Affairs said that bluetongue was different from foot-and-mouth, but many precautions already in place could help to control its spread. "This is absolutely devastating news," said James Mulleneux, of the National Farmers Union. "The industry has been fearful that this would happen in England." No vaccine is available currently for the strain of the disease that has hit Northern Europe, where export and animal movement bans have been imposed following outbreaks. Once infected, up to 70% of a flock of sheep can die from the virus. While infected animals can recover - and become immune - productivity is reduced with milk yields in dairy herds dropping by about 40%. Prime Minister Gordon Brown was briefed after arriving in Bournemouth for the Labour Party conference, and the BBC's Carole Walker said he was prepared to chair a meeting of the emergency committee Cobra on Sunday if an outbreak was confirmed. Professor Hugh Pennington, a microbiologist, said wide-ranging zones restricting animal movements would have a severe economic impact on the farming industry. "It would be very bad news if this virus got established here," he said. In Scotland, where in July scientists began researching the midge population in response to the spread of the virus, the government urged farmers to watch for signs of the disease in their livestock. "Bluetongue can have a significant effect on the livestock sector and our best defence is good biosecurity and vigilance for signs of disease," a spokesman said.